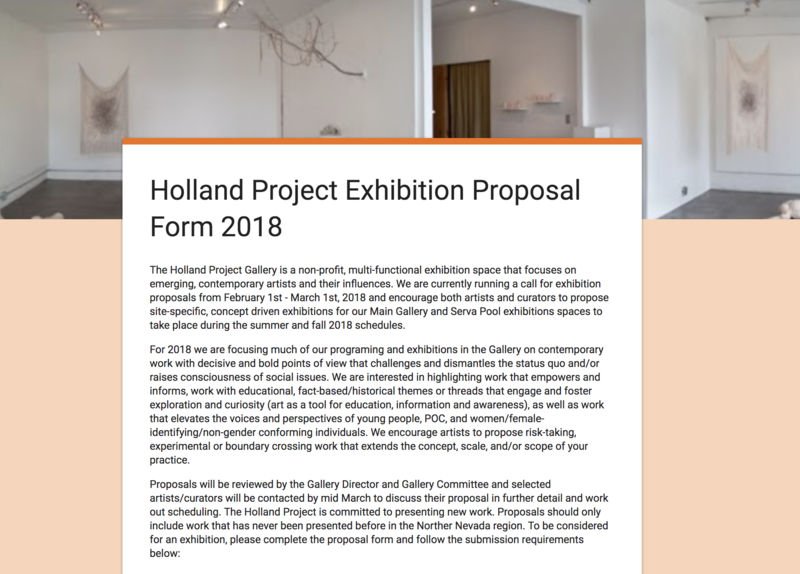 We are currently running an open call for exhibition proposals from February 1st – March 30th, 2018 and encourage both artists and curators to propose site-specific, concept driven exhibitions for the Main Gallery and Serva Pool exhibitions spaces at Holland to take place during the summer and fall 2018 schedules. For 2018 we are focusing much of our programing and exhibitions in the Gallery on contemporary work with decisive and bold points of view that challenges and dismantles the status quo and/or raises consciousness of social issues. We are interested in highlighting work that empowers and informs, work with educational, fact-based/historical themes or threads that engage and foster exploration and curiosity (art as a tool for education, information and awareness), as well as work that elevates the voices and perspectives of young people, POC, and women/female-identifying/non-gender conforming individuals. We encourage artists to propose risk-taking, experimental or boundary crossing work that extends the concept, scale, and/or scope of your practice. If you are an artist or curator interested in proposing an exhibition for one of our exhibition spaces follow the link below to submit a proposal! Deadline for consideration in our Summer-Fall 2018 schedule is March 30th, 2018! !